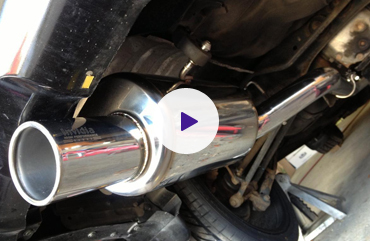 With a sea of aftermarket exhaust systems in the marketplace from all over the world, it can be difficult even for the discerning customer to decypher what makes the difference between a quality system, a cheap system, and when you're just paying for an brand name. Invidia Exhausts Australia warrants all of its products with a limited lifetime warranty policy. Warranty claims must be accompanied by the original sales receipt from an authorised dealer. A trained professional must install all Invidia products. Any issues with compatibility or installation should be addressed before attempting to install the product. No modifications are to be made with out the consent of Invidia Exhausts Australia. Warranty will be voided if not installed by qualified person or Authorsied Dealer. Invidia R400 tuned muffler exhaust systems offer a rich exhaust note which enhances the natural tone of your car's engine. Utilising Grade 5 pure titanium, Invidia G5 Titan Exhaust systems not only look fantastic, but ensure optimal strength and durability whilst keeping weight to a minimum. The term ‘Invidia Exhausts’ or ‘us’ or ‘we’ refers to the owner of the website whose registered office is 22/218 Wisemans Ferry Road, SOMERSBY, NSW, 2250, AU. Our ABN is . The term ‘you’ refers to the user or viewer of our website.